We measured the abundances of Sr and rare earth elements (REEs) in the matrices of five CV3 carbonaceous chondrites: Meteorite Hills (MET) 00430, MET 01070, La Paz ice field (LAP) 02206, Asuka (A) 881317 and Roberts Massif (RBT) 04143. In the MET 00430 and MET 01074 matrices, the Sr/CI and light REE (LREE, La–Nd)/CI ratios positively correlate with the amounts of Ca-rich secondary minerals, which formed during aqueous alteration in the CV3 chondrite parent body. In contrast, in the LAP 02206 and RBT 04143 matrices, although the Sr/CI ratios correlate with the amounts of Ca-rich secondary minerals, the LREE/CI ratios vary independently from the amounts of any secondary minerals. This suggests that the LREE/CI ratios in these matrices were produced prior to the parent body alteration, probably in the solar nebula. 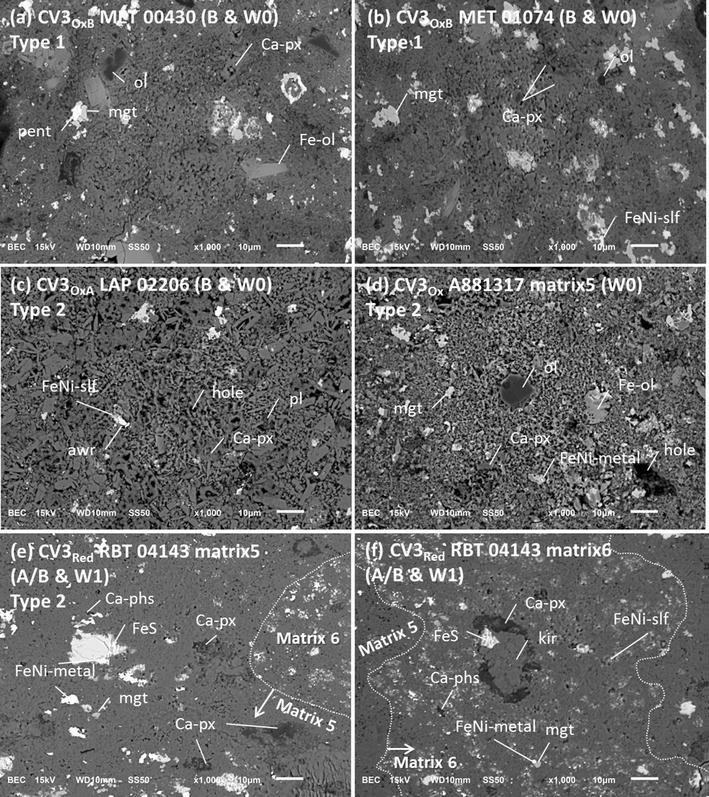 The LREE/CI ratios of the LAP 02206 and RBT 04143 matrices reveal the mixing process of matrix minerals prior to the accretion of the CV3 chondrite parent body. The mixing degrees of matrix minerals might be different between these two matrices. Because solid materials would be mixed over time according to the radial diffusion model of a turbulent disk, the matrix minerals consisting of LAP 02206 and RBT 04143 matrices might be incorporated into their parent body with different timing. In water-bearing asteroids, aqueous alteration, the chemical reaction between aqueous fluids and primary minerals formed in the solar nebula, had taken place after the melting of ice due to the decay heat of short-lived radiogenic nuclides such as 26Al and 60Fe (e.g., Brearley and Krot 2013). During the aqueous alteration, soluble elements (e.g., Sr) would be redistributed from primary minerals in the matrices, chondrules and Ca–Al-rich inclusions to secondary minerals through aqueous fluids. This process would result in non-CI–chondritic Sr abundances of matrices in the heavily aqueous-altered carbonaceous (e.g., CM2 and CR2) and unequilibrated ordinary chondrites (e.g., Alexander 1995; Bland et al. 2005). In contrast, in primitive carbonaceous chondrites (e.g., CO3 and CV3), only CV3 Bali, which has similar alteration conditions to CM2 or CR2 chondrites, shows higher Sr abundances of matrix compared to CI chondrite (e.g., Bland et al. 2005). Typically, matrices in CO3 and CV3 chondrites preserve the Sr abundance of CI chondrite (e.g., Hua et al. 1996; Bland et al. 2005; Martin et al. 2013). This indicates that elements with relatively lower solubility compared with Sr (e.g., Au, Ga and Se) would not be redistributed during aqueous alteration (e.g., Bland et al. 2005). However, it was found that Sr is present in secondary minerals in matrices of CV3 Allende and Vigarano chondrites (Dyl et al. 2014). In addition, Sr abundances of some parts of Allende matrix are different from CI chondrite abundance (Inoue et al. 2004). Because Allende and Vigarano are typical CV3 chondrites and are not heavily aqueous-altered as is Bali, we expect that redistribution of Sr might have occurred even in the typical CV3 chondrites during aqueous alteration in their parent body. To verify this hypothesis, we measured the Sr and REE (lower solubility than Sr) abundances of matrices in the CV3 MET 00430, MET 01070, LAP 02206, A 881317 and RBT 04143 chondrites using secondary ion mass spectrometry. We performed mineralogical observations of five CV3 chondrites including all CV3 subtypes: the oxidized Allende-like type (CV3OxA) LAP 02206, the oxidized Bali-like type (CV3OxB) MET 01074 and CV3OxB MET 00430, and the reduced type (CV3Red) RBT 04143 and CV3Red A 881317 (e.g., Weisberg et al. 1997). The analytical methods are described in Additional file 1. These samples are all Antarctic find-type meteorites, and their terrestrial weathering grades are A/B for RBT 04143, B for MET 00430, MET 01047 and LAP 02206, and no data for A 881317 (e.g., Meteorite bulletin). A section of RBT 04143 that we studied contains Fe oxide weathering products in cracks and fractures of the section (Additional file 1: Fig. S1). In contrast, sections of the other four CV3 chondrites do not contain such weathering products. The general petrography of these five CV3 chondrites was described in Ishida et al. (2015) and Jogo et al. (2017). Briefly, the RBT 04143 and A 881317 chondrites are breccias consisting of many clasts (e.g., Fig. 2 in Jogo et al. 2017). A typical clast (from 0.5 to 1 mm in size) is composed of chondrules and surrounding olivine-rich fine-grained materials. The clasts are either embedded in the host matrix or in direct contact with adjacent clasts. In contrast, such clasts were not observed in the LAP 02206, MET 00430 or MET 01074 chondrites. For a more detailed mineralogical and chemical analysis, we selected six matrices: host matrices from the MET 00430, MET 01074 and LAP 02206 chondrites, one matrix from the A 881317 chondrite (A 881317 matrix 5) and two matrices from the RBT 04143 chondrite (RBT 04143 matrix 5 and matrix 6) (Fig. 1). In the RBT 04143 and A 881317 breccias, we chose the matrices with clear clast boundaries in the backscattered electron images (Fig. 1). All of the matrices we measured consist primarily of ferrous olivine grains, but the grain sizes and porosities differ among matrices (e.g., Fig. 1). Primary and secondary minerals occur between matrix olivine grains. Their species and distributions are different in each matrix. In the host matrices of MET 00430 and MET 01074 chondrites, similar secondary minerals were observed; Ca-pyroxene, Fe, Ni-sulfide, ferrous olivine, fayalite, magnetite and altered silicates occur in these matrices (Fig. 1a, b and Additional file 1: Table S1). These mineral species are similar to those of CV3OxB matrices (e.g., Krot et al. 1998). In the LAP 02206 host matrix, Ca-pyroxene, awaruite, Fe, Ni-sulfide, ferrous olivine, sodalite and plagioclase were observed (Fig. 1c and Additional file 1: Table S1). These mineral species are consistent with those of CV3OxA matrices (e.g., Krot et al. 1998). In the A 881317 matrix 5, Ca-pyroxene, Ca-phosphate, relict Fe, Ni-metal, ferrous olivine and magnetite were observed (Fig. 1d and Additional file 1: Table S1). Fe-sulfide and Fe, Ni-sulfide are rare. These mineralogical features are similar to those of the CV3Ox matrix (e.g., Krot et al. 1998), suggesting that the clast including the A 881317 matrix 5 would be the CV3Ox clast in the CV3Red A881317 breccia. In the RBT 04143 matrices 5 and 6, similar primary and secondary minerals were observed: kirschsteinite, Ca-pyroxene, Ca-phosphate, Fe, Ni-metal, kamacite, Fe-sulfide, Fe, Ni-sulfide, ferrous olivine and magnetite occur in these matrices (Fig. 1e, f and Additional file 1: Table S1). Small Fe, Ni-sulfide grains (< 2 µm in size) are abundant only in the RBT 04143 matrix 6 (Fig. 1f and Additional file 1: Table S1). These mineralogical features are similar to those of the CV3Red matrix (e.g., Krot et al. 1998). We could not find any evidence of terrestrial weathering such as oxidation of opaques in the measured matrices (e.g., Wlotzka 1993). We measured the chemical compositions of six matrices (analytical methods are described in Additional file 1): 14 data from the CV3OxB MET 00430 host matrix, 10 data from the CV3OxB MET 01070 host matrix, 11 data from the CV3OxA LAP 02206 host matrix, 5 data from the CV3Ox A 881317 matrix 5, 5 data from the CV3Red RBT 04143 matrix 5 and 3 data from the CV3Red RBT 04143 matrix 6. We carefully chose matrix areas without Fe oxide weathering veins in CV3Red RBT 04143 (Additional file 1: Fig. S1). The measured matrices have various Sr abundances and show some departures from CI chondrite abundance (Fig. 2 and Additional file 1: Table S2). The averaged Sr/Yb ratios normalized to the CI chondrite abundance of each matrix are < 0.8 or > 1.3 (Additional file 1: Table S2). The averaged Sr/CI ratios are 0.9–3.2, and only the CV3OxA LAP 02206 host matrix and the CV3Red RBT 04143 matrix 5 show CI chondrite abundance (averaged Sr/CI ratios of 0.9–1.0). The range of Sr/CI ratios within an individual matrix is different among matrices. The CV3OxA LAP 02206 host matrix, the CV3Ox A 881317 matrix 5 and the CV3Red RBT 04143 matrix 5 show moderately broad Sr/CI ratios with a standard deviation of < 0.4. The rest of the CV3OxB MET 00430 and the CV3OxB MET 01074 host matrices and the CV3Red RBT 04143 matrix 6 show broad Sr/CI ratios with a standard deviation of > 0.8. The LREE abundances of measured matrices are also various and show some departures from CI chondrite abundance (Fig. 2 and Additional file 1: Table S2). The averaged LREE/CI ratios of the CV3Ox A 881317 matrix 5 and the CV3Red RBT 04143 matrices 5 and 6 are similar to CI chondrite abundance (e.g., averaged La/CI ratios of 1.0–1.4). The rest of the CV3OxB MET 00430 and CV3OxB MET 01074 host matrices and the CV3OxA LAP 02206 host matrix show higher LREE/CI ratios than CI chondrite abundance (e.g., averaged La/CI ratios of 1.6–1.8). The ranges of LREE/CI ratios are narrow in the CV3OxA LAP 02206 host matrix, the CV3Ox A 881317 matrix 5 and CV3Red RBT 04143 matrix 5 (e.g., standard deviation of La/CI ratios of ~ 0.2–0.3), but they are broad in the CV3OxB MET 00430 and CV3OxB MET 01074 host matrices and the CV3Red RBT 04143 matrix 6 (e.g., standard deviation of La/CI ratios of ~ 0.5–0.7). Small Ce anomalies are detected in each matrix (Fig. 2). The Ce anomalies are not correlated with the matrix compositions with respect to soluble elements such as Ca, Sr and Nd (Additional file 1: Fig. S2). The abundances of middle to heavy REEs (MREE and HREE; Nd–Lu) are less various compared to those of LREEs (Fig. 2). The MREE/CI and HREE/CI ratios are consistent with the errors within individual matrices and among different matrices (MREE/CI = 0.2–3.6 and HREE/CI = 0.5–2.4 in all matrices; Fig. 2 and Additional file 1: Table S2). Most of the matrices show Eu anomalies with large uncertainties; both positive and negative anomalies were detected in each matrix (Fig. 2). Correlations between the Sr/CI and La/CI (representative of REEs) ratios and chemical compositions of matrix have been investigated (Table 1, Fig. 3 and Additional file 1: Fig. S3). For the Sr/CI ratio and Ca contents, all matrices except the CV3Red RBT 04143 matrix 6 show strong positive correlations with correlation coefficients of R2 ≧ 0.7. For the La/CI ratio and Ca contents, only host matrices in the CV3OxB MET 00430 and CV3OxB MET 01074 chondrites show moderate to strong positive correlations with correlation coefficients of R2 ≧ 0.6. For the La/CI ratio and the other elements’ contents, only the CV3Ox A 881317 matrix 5 shows a moderate positive correlation between La/CI and P contents with a correlation coefficient of R2 ~ 0.6. The rest of the CV3Red RBT 04143 matrices 5 and 6 and the CV3OxA LAP 02206 host matrix do not show strong positive correlations between La/CI and chemical compositions (R2 ≦ 0.3). There is also no clear correlation between La/CI ratios and modal abundances of magnetite in these matrices (Table 1 and Additional file 1: Fig. S3). The weathering grades of our samples are A/B to B, whereas no Fe oxide weathering products were observed in their matrices (e.g., Fig. 1); minor Fe oxide weathering veins occur only in CV3Red RBT 04143 (Additional file 1: Fig. S1). In weathered Antarctic meteorites, the precipitation of Fe oxide weathering products is confined to fractures through the meteorite and voids in the fusion crust, rather than being pervasively distributed throughout the matrix (Abreu and Brearley 2010). The low permeability of the matrix might limit the incorporation of terrestrial water into the matrices and prevent them from experiencing terrestrial weathering. A similar process might have occurred in the matrices we measured and result in no precipitation of weathering products in them because CV3 matrices would have low permeability (Bland et al. 2009). Based on the weathering scale for ordinary chondrites (e.g., Wlotzka 1993), the weathering grades of the sections we studied are estimated to be W1 for CV3Red RBT 04143 with minor Fe oxide weathering veins and W0 for the rest of the samples with no Fe oxide weathering products. The measured matrices with weathering grade W1 show similar or lower Ca, Sr and REE abundances compared to those with weathering grade W0 or matrices in the unweathered fall-type CV3 chondrites (Fig. 2g, Hua et al. 1996; Inoue et al. 2004; Bland et al. 2005; Martin et al. 2013). This may suggest that leaching of soluble elements might occur during terrestrial weathering in the matrices with weathering grade W1. However, they do not show preferential depletion in soluble Ca, Sr and LREEs compared to the find-type CV3 matrices. The depleted elements are Ce, Pr, Sm, Tb, Ho and Tm, which do not have high solubility in water, suggesting that soluble element abundances of the matrices with weathering grade W1 would not be disturbed during terrestrial weathering. In addition, in Antarctic achondrites, oxidation of Ce3+ to the more insoluble Ce4+ caused the separation of this element from the other LREEs, resulting in Ce anomalies (e.g., Floss and Crozaz 1991; Crozaz et al. 2003). The leaching of soluble elements from achondrites would cause low soluble element abundances with positive Ce anomalies. We expect that a similar process would occur in the CV3 matrices we measured. However, a tendency for positive Ce anomalies to occur at low Ca, Sr and LREE concentrations was not found in the measured matrices (Additional file 1: Fig. S2). This indicates the same conclusion that Ca, Sr and LREEs would not be leached from the matrices with weathering grade W1 during terrestrial weathering. Therefore, the Ca, Sr and LREE abundances of the matrices we measured would probably reflect preterrestrial processes, i.e., nebular or asteroidal alteration processes. Although only the CV3Red RBT 04143 matrix 6 shows a negative correlation between Sr abundances and Ce anomalies, it will not be discussed further because of its small number of data. Based on the correlation between the Sr/CI, La/CI ratio and the Ca contents of a matrix, the matrices could be classified into two types (Table 1): [type 1] CV3OxB MET 00430 and CV3OxB MET 01074 host matrices, characterized by moderate to strong positive correlations between the Sr/CI and La/CI ratios and the Ca contents (R2 ~ 0.6–0.9); and [type 2] CV3OxA LAP 02206 host matrix, CV3Ox A 881317 matrix 5 and CV3Red RBT 04143 matrix 5, characterized by strong positive correlation between the Sr/CI ratio and Ca contents (R2 ~ 0.7–0.9) but no strong correlation between the La/CI ratio and Ca contents (R2 ~ 0.0–0.2). We will discuss whether any redistribution of Sr and LREEs occurred during aqueous alteration in type 1 and 2 matrices in the following sections. The Sr/CI and La/CI ratios of a type 1 matrix are positively correlated with the Ca contents of the matrix (Table 1 and Fig. 3). This implies that the amounts or mineral species of the Ca-rich phase control the Sr/CI and La/CI ratios of a type 1 matrix. The Ca-rich phase in a type 1 matrix is Ca-pyroxene (Additional file 1: Table S1 and Fig. 1a, b), which is a secondary mineral formed during aqueous alteration in the CV3 chondrite parent body (e.g., MacPherson and Krot 2014). The Sr and LREE partition coefficients in Ca-pyroxene from melt are highest among those in secondary minerals in a type 1 matrix (e.g., Kuehner et al. 1989; Nielsen et al. 1992; Kennedy et al. 1993; Prowatke and Klemme 2006; Sun et al. 2017, Additional file 1: Fig. S4). This suggests that the Sr and LREEs in aqueous fluids would be preferentially incorporated into Ca-pyroxene during its formation. Since the amounts of Ca-pyroxene minerals control the Sr and LREE abundances of the matrix, the Sr and LREE abundances of a type 1 matrix would be disturbed during aqueous alteration in the parent body. The Sr/CI ratios of the type 2 matrix are positively correlated with the Ca contents of the matrix, but the La/CI ratios are not (Table 1 and Fig. 3). This implies that the amounts or mineral species of the Ca-rich phase control the Sr/CI ratios of the matrix, but the La/CI ratios of the matrix are controlled by other factors. Concerning positive correlations between the Sr/CI ratios and Ca contents, we adopt the same logic for explaining the Sr abundance of type 1 matrix. The Ca-rich phases in type 2 matrix are kirschsteinite, Ca-pyroxene, Ca-phosphate and plagioclase (Fig. 1c–e and Additional file 1: Table S1), which are all secondary minerals (e.g., Krot et al. 1998; MacPherson and Krot 2014). Because the Sr partition coefficients in these minerals are high (Additional file 1: Fig. S4), the Sr in aqueous fluids would be preferentially incorporated into them during their formation. Since the amounts of these secondary minerals control the Sr abundance of the matrix, the Sr abundance of a type 2 matrix would be disturbed during aqueous alteration in the parent body. Regarding the lack of a strong positive correlation between the La/CI ratio and Ca contents of the matrix, there could be two possible explanations: (1) La in the aqueous fluids was incorporated into Ca-poor secondary minerals, and the amounts of such minerals controlled the LREE abundances of matrix or (2) La was not dissolved in the aqueous fluids. There are no secondary minerals that have higher LREE partition coefficients than those of the Ca-rich secondary minerals in a type 2 matrix (Additional file 1: Table S1 and Fig. S4). Thus, case 1 would not be possible. Therefore, we propose case 2 as a mechanism for explaining the La/CI ratios of the type 2 matrix. The lack of any clear positive correlations between La/CI ratios and chemical compositions of type 2 matrix would also support case 2 (Table 1 and Additional file 1: Fig. S3). Although the CV3Ox A 881317 matrix 5 shows moderate positive correlation between La/CI ratios and P contents (R2 ~ 0.6), the range of P content is too narrow to discuss the correlation (e.g., Additional file 1: Fig. S3-2a). The correlations between Sr/CI, La/CI and the chemical composition of type 1 and 2 matrices suggest that the Sr abundances were disturbed in both type 1 and 2 matrices (including all CV3OxA, CV3OxB and CV3Red subtypes), but those of LREEs were disturbed only in the type 1 matrix (the CV3OxB subtype). There are also some CV3 chondrites (including all CV3OxA, CV3OxB and CV3Red subtypes) with Sr and REE abundances of matrices that would not be disturbed during aqueous alteration (e.g., Bland et al. 2005). These findings may suggest that there is no correlation between CV3 subtypes (CV3OxA, CV3OxB and CV3Red) and that there is some redistribution of Sr and/or LREE abundances in CV3 matrices. Because the dissolution of Sr and La in aqueous fluids would reflect the aqueous alteration conditions (e.g., temperature, pH and chemical composition of fluids, Michard 1989), the lack of a correlation between subtypes and Sr and La dissolution may imply that aqueous alteration conditions might be various even in the same subtype of CV3 chondrites. The chemical compositions of CV3 matrices could reflect nebular processes, aqueous alteration in the CV3 chondrite parent body and/or terrestrial weathering processes (e.g., Floss and Crozaz 1991; Bland et al. 2005). The LREE abundances of type 2 matrix (the CV3OxA LAP 02206 host matrix and the CV3Red RBT 04143 matrix 5) would not be disturbed during terrestrial weathering or aqueous alteration in their parent body (“The effect of terrestrial weathering on matrix Sr and LREE abundances” and “Redistribution of Sr and LREEs in the matrix during aqueous alteration in the parent body” sections). This then implies that their LREE abundances would reflect the nebular process prior to the accretion of their parent body. In the CV3OxA LAP 02206 host matrix, the LREE patterns are similar among measurement spots: All are convex downward with lower abundances of Ce and Pr than La and Nd (Fig. 2c). This may imply that (1) all the matrix minerals experienced similar thermal processes in the solar nebula or (2) although each matrix mineral was formed by different nebular processes, they were well mixed prior to the accretion to their parent body. In contrast, in the CV3Red RBT 04143 matrix 5, the LREE patterns are slightly different among measurement spots (Fig. 2e). This may imply that the matrix minerals retained their heterogeneity when the CV3Red RBT 04143 matrix accreted to its parent body. The specific minerals or nebular processes that control the LREE abundances of matrices could not be constrained in this study. Inoue et al. (2004) suggested the existence of some unknown LREE-enriched components in CV3 Allende matrices. The LREE abundances of matrices might reflect the complementary chondrule/matrix formation process in which the chondrules and matrix formed complementarily from a single LREE reservoir (e.g., Inoue et al. 2004; Bland et al. 2005). The different LEE patterns of the CV3OxA LAP 02206 and the CV3Red RBT 04143 matrices may be explained by the radial diffusion model of a turbulent disk (Cuzzi et al. 2010). This could introduce the difference in the degree of material mixing with time in the solar nebula. In the case of (1), the CV3OxA LAP 02206 matrix would accrete to its parent body before mixing with other matrix minerals. In the case of (2), matrix minerals were well mixed when the CV3OxA LAP 02206 host matrix accreted to its parent body. In contrast, the matrix minerals retained their heterogeneity when the CV3Red RBT 04143 matrix accreted. To produce the difference in mixing degrees of matrix minerals, the matrix minerals consisting of CV3OxA LAP 02206 and CV3Red RBT 04143 matrices might be incorporated into their parent body with different timing. The Sr and REE abundances of six matrices in five CV3 chondrites were measured. The correlations between the Sr, La and Ca abundances of the matrices suggest that Sr and LREEs would have been redistributed in the MET 00430 and MET 01070 matrices during aqueous alteration in their parent body. Only the LAP 02206 and RBT 04143 matrices would preserve the LREE abundances that reflect nebular processes. The correlations between the Sr, LREE and Ca abundances of matrices will be useful for distinguishing CV3 matrices with Sr and LREE abundances that reflect nebular processes from those that reflect aqueous alteration processes in their parent body. KJ performed the mineralogical observations, and KJ, MI and SK performed the SIMS measurements. KJ wrote the initial draft of the manuscript with MI, TM, SK and JL. All authors contributed to interpreting the results, writing the discussion and revising the manuscript. All authors read and approved the final manuscript. The meteoritic samples were provided by the National Institute of Polar Research (Japan) and the NASA Johnson Space center. We thank Ms. Moon and Dr. Park for the support to use SEM and FE-EPMA. We appreciate the detailed comments from Dr. Fujiya and an anonymous reviewer. We also thank Prof. Noguchi for the editorial handling. The data and materials are available upon request from the corresponding author (kaorijogo@kopri.re.kr). This work was supported by KOPRI project PM17030. MI was supported by the JSPS Grants-in-Aid for Science Research (no. 26287142) from the Shimadzu Science Foundation (2016). This work was supported in part by the Kochi Core Center Open Facility System under the MEXT foundation. 40623_2018_809_MOESM1_ESM.docx Additional file 1. The analytical methods and figures and tables showing mineralogy and chemical compositions of CV3 matrices and the Sr and REEs partition coefficients for mineral/melt.